As it has always been done, there is no fee for this ceremony. Contributions are welcomed. No pets, drugs or alcohol. We gather on site between 9:30 – 10 am. Ceremony starts at 10:00! 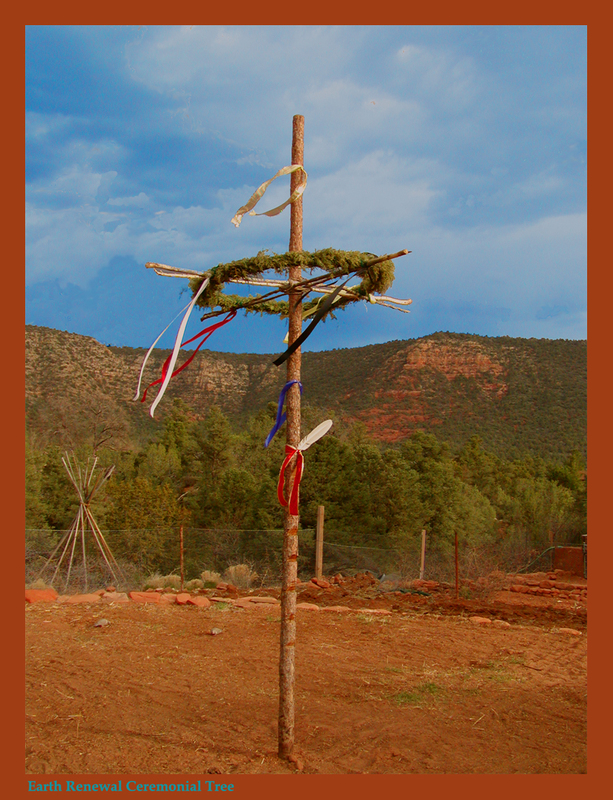 The Earth Renewal Tree is, in addition to a representation of the pathway we Shamans follow in our journeys into the Celestial Realms of Light, Knowledge and Spiritual Awakening, a calendar which provides us reference as to our location in time. 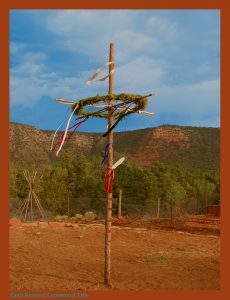 At the time of the Spring Equinox the Earth Renewal Dance is done in order to dance the Earth Mother awake. Calling her to life and fertility, with a deep heartfelt appreciation, we participate in her renewal. 5. Turn left into Red Rock Crossing/Crescent MoonPark. 6. Go to far end of parking lot, go to Crescent Moon Group Area. NOTE: Carpool! If you arrive with four in your car, I will provide you with a free parking pass. All others must pay the Park their parking fee of $10. At the completion of the dancing and singing a woman is chosen to sit at the base of the Yupa, there to be embodied of the Earth Mother. Each person steps forth to give a gift to the Earth Mother. A short acknowledgmetn of the gift’s personal significance is made. Gifts are of both personal significance and value. The greater the value, the more honor is given(Traditionally, in a Give-Away, horses, houses, cars, Pendelton blankets, jewelry are given… do what is right for you. There is no judgment of your gift). The gift is in recognition that all ‘personal belongings’ are truly ours but for a moment, that they are really items created of the body of our Mother Earth. Each person steps forth, one-by-one and speaks of the significance of the gift they sre offering the Earth. When all have given their gift, we each re-enter the circle and recieve a gift from the Earth Mother, usually different than the one we brought. The amazing power of the gift is, in part, the significance that has been passed along from the Giver to the Earth Mother and thence to you. Give-Away gifts are not gifts to the ceremonial leader. Ceremonial leaders give and recieve the same as everyone else. Please bring a home-prepared dish! make it with love and care. If you really can’t bring a home-prepared dish, please bring something healthy and vital. Each person brings a dish to share with the gathered community. Use your own intuition as to what to bring. If you eat meat or fish, maybe bring a meat dish. If a vegetarian, bring a veg/vegan dish. We are inclusive, not exclusive and honor the blessing of FOOD, not dietary styles. There are barbecue grills on site. Bring charcoals if you wish to use one. I will bring a few propane camp stoves for heating pre-prepared items. I will also bring some plastic ware, plates, bowls, cups, napkins, etc. Picnic tables and a covered area are available on site.